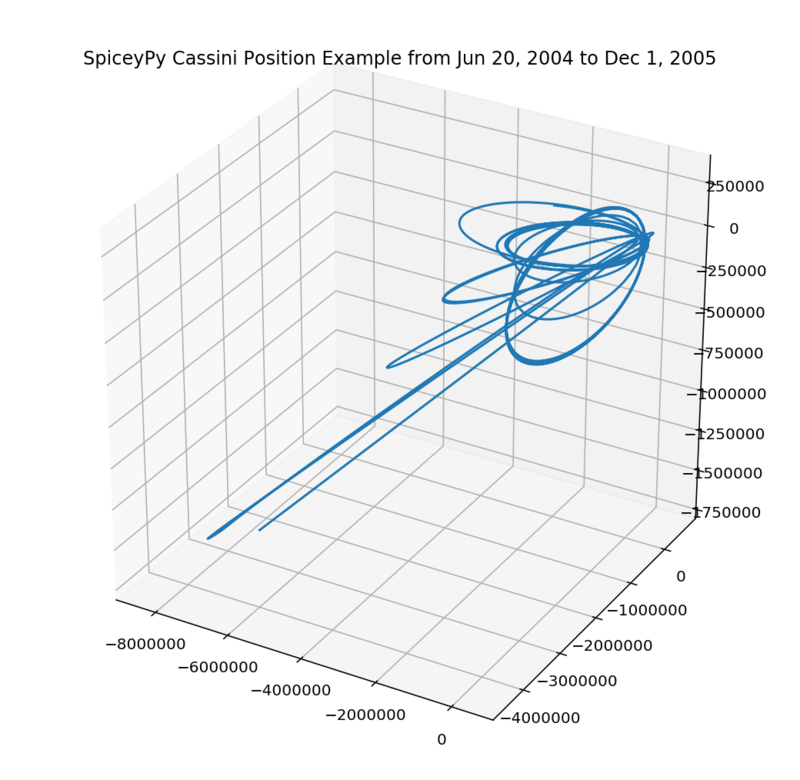 Below is an example that uses spiceypy to plot the position of the Cassini spacecraft relative to the barycenter of Saturn. First import spiceypy and test it out. We will need to load some kernels. You will need to download the following kernels from the NAIF servers via the links provided. After the kernels have been downloaded to a common directory write a metakernel containing the file names for each downloaded kernel (provided after the links). I named the metakernel ‘cassMetaK.txt’ for this example. For more on defining meta kernels in spice, please consult the Kernel Required Reading. # The meta kernel file contains entries pointing to the following SPICE kernels, which the user needs to download. :param targ: Target body name. :param ref: Reference frame of output position vector. :param abcorr: Aberration correction flag. :param obs: Observing body name. One way light time between observer and target. We will use matplotlib’s 3D plotting to visualize Cassini’s coordinates. We first convert the positions list to a 2D numpy array for easier indexing in the plot.